A cross party group of local people, environmentalists and politicians are spearheading the campaign against the incinerator. It is hoped that the group, Hatfield Against Incineration, could be the start of a civic movement in Hatfield that will stand up for the town and its people. And all Hatfield residents have a part to play. Or you could do nothing and live with the consequences. It IS possible to stop the incinerator being built in Hatfield – or anywhere else in Hertfordshire as it still would have an impact on people. In fact, following public opposition, incinerator proposals have been rejected by a number of local authorities in a number of areas including Derby, Guernsey, Perth, Surrey, Telford and Wrekin, and a proposed shared facility for Bath, Bristol, South Gloucestershire and North East Somerset. An incinerator for Cardiff is being delayed as the Environment Agency re-evaluates the health advice. A judicial review has been secured by opponents of a chicken waste incinerator at Glenavy. While there are calls for a referendum on having an incinerator in Kings Lynn. Another reason to hope is that Welwyn Hatfield MP, Grant Shapps, who as an opposition MP publicly declared at a meeting in Welham Green that having an incinerator next to a major residential town like Hatfield was 'madness', is now a Conservative cabinet minister. He has already claimed successes in reversing the decisions to close the QEII accident and emergency ward and the Royal Mail sorting office in Welwyn Garden City. Given that Hertfordshire County Council, the body making the decisions on the incinerator proposals is Conservative controlled (as is Welwyn Hatfield Borough Council) it is hoped that he'll be able to deliver a similar result for Hatfield and Radlett. Not least of all, because his constituency office is in Hatfield. However, the people of Hatfield need to make their opposition clear in order to strengthen his hand (the WGC sorting office petition had around 7,000 signatures). People in Hatfield should not bank on ministerial good offices alone being enough. Indeed it is better to assume that Hatfield's future is in the hands of Hatfield residents and not count on anyone else. However, there already is a cross-party group (Hatfield Against Incineration) with backing of environmental bodies that is already fighting Hatfield's corner (and supports neighbouring Radlett wishes not to have an incinerator as well). Basically, if there was only a small amount of waste there is no need for landfill or incinerators. Certainly, not in the numbers or on the scale being proposed currently. Reduce. Reuse. Recycle – is essentially the key to living in a society or country without limitless resources (especially a cash-strapped one like ours) needs to adopt to survive. Only cook the amount of food you are likely to eat as it reduces the amount of food waste (it would also help keep your food bills down). Waste food could be used for compost (in your garden, if you have one) or put out to be collected in the council-issued brown bins. Recycle paper, bottles, tins and other metal objects – there are collection points around Hatfield and some supermarkets also offer additional facilities, like collecting old batteries. The council operates household collection of paper (green bins), and bottles and metal waste (red bins). There are a number of tactics and strategies that could be adopted to convince those concerned that blighting Hatfield for at least the next quarter century will have consequences for them that would last beyond any planning process. Target the decision makers – like Councillor Derrick Ashley, member for Hitchin South and Executive Member for Environment, Planning & Waste at Hertfordshire County Council. Target the party – currently Hertfordshire County Council and Welwyn Hatfield Borough Council are under Conservative control. Target the companies – Veolia Environmental Services, which is proposing to operate an incinerator at New Barnfield, appears to have contracts with other companies in Hatfield (like Asda and Ocado). 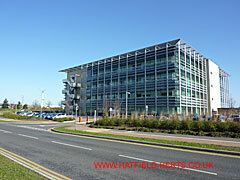 Veolia Water, another part of the Veolia Group, has its offices in Hatfield. Please note: all protests should be peaceful and law abiding. To do otherwise would undermine the whole effort – and reinforce negative views of Hatfield and its people. The leadership of this cross-party group will decide the strategy or strategies to be adopted. It could also possibly lead to Hatfield's answer to WGC lobby groups, like the Welwyn Garden City Society, to ensure that Hatfield is not seen as an easy option for things not wanted in WGC or elsewhere in Hertfordshire. 4. Donating money to cover expenses / fund a legal challenge. 5. Take part in public consultations. Currently, the focus is on objecting to the incinerator only aspect of the Hertfordshire County Council's Waste Strategy proposals, which is open to public consultation till 13 December 2010. There are other aspects to be considered as well – like the validity of arguments that the site should be selected as it offers access by rail if they haven't got plans or planning permission as to where household waste from towns in the north of the county is going to be transferred to the rail network. Full details on responses to the consultations and other aspects of the campaign and group can be found on the HAI website and blog (contains advice on how to respond to the Waste Strategy consultation).